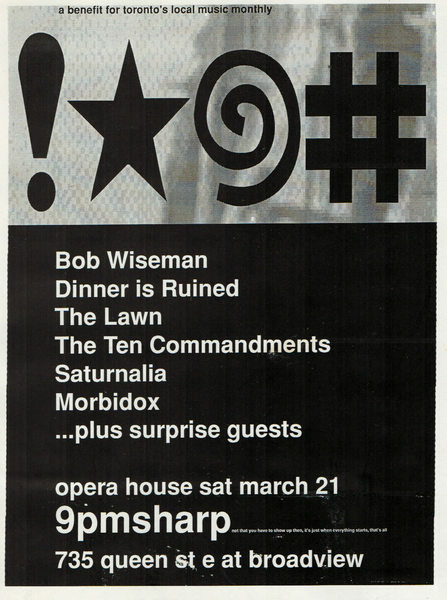 Invitation admits one entry to the Festival of Festivals Midnight Madness in 1990. The event took place on Friday, September 14 from 8:30 - 10:30 PM. 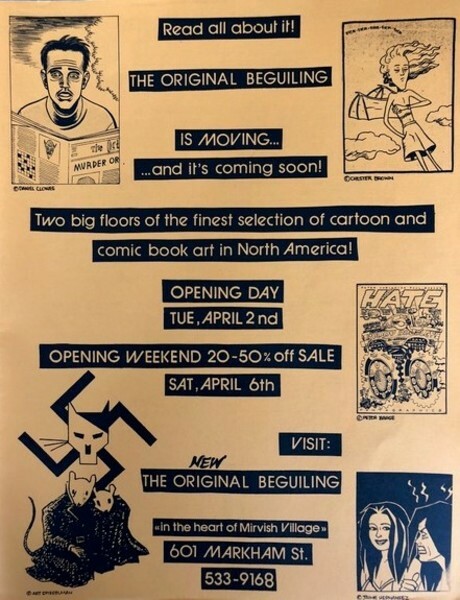 Flyer alerting the comic buying masses that The Beguiling is moving from its original 185 Harbord Street location to "swanky" Mirvish Village. Sticker promoting Exclaim! 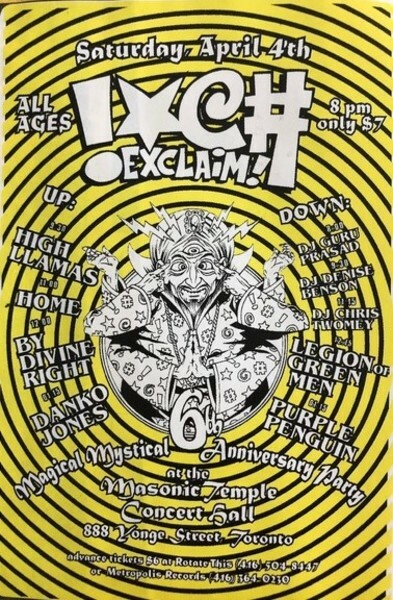 Magazine's Magical Mystical 6th Anniversary Party at The Masonic Temple featuring By Divine Right, Danko Jones, DJ's Denise Benson & Chris Twomey and many others. 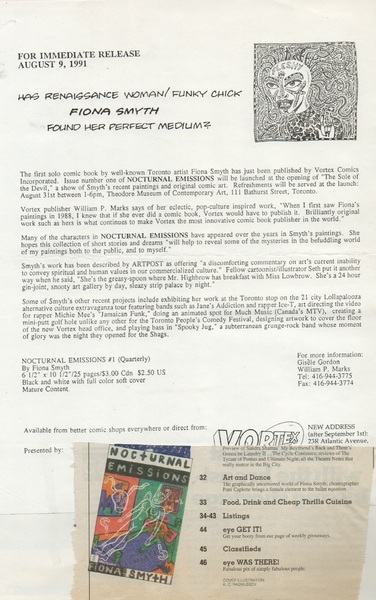 Press release for the launch party held at the Theodore Museum of Contemporary Art for Toronto artist Fiona Smyth's comic Nocturnal Emissions, published by Vortex Comics. 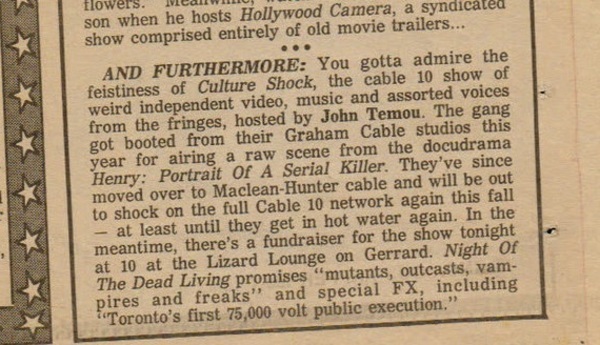 Promotional Flyer for Night of the Alien Scumbags, an evening of low ball insanity presently by Culture Shock at The Lizard Lounge. 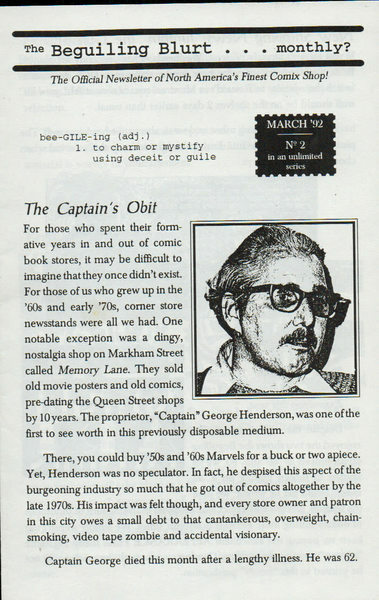 Four page official newsletter of "North America's Finest Comix Shop" which may still be true all these years later. 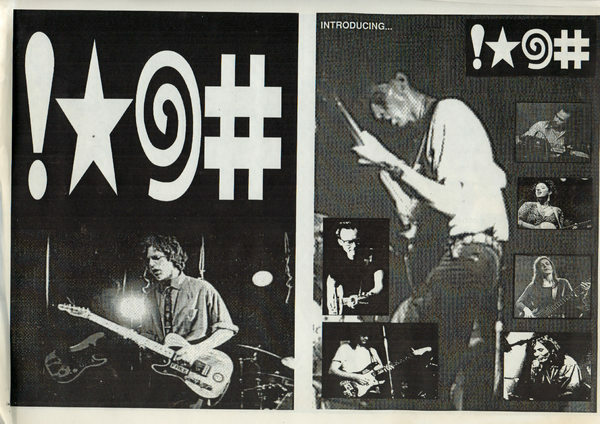 Promotional flyer for then-new Exclaim! Magazine and its launch party at The Opera House. 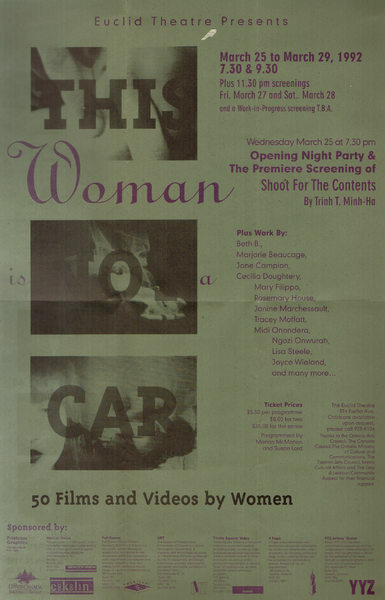 Poster advertising This Woman is Not a Car - 50 Films and Videos by Women series at the Euclid Theatre. Long time Exclaim! contributor Fiona Smyth makes the cover. 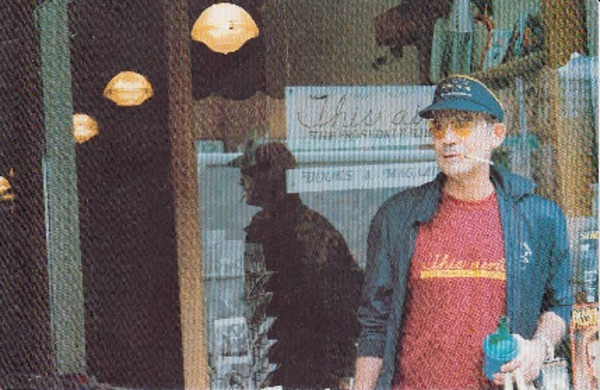 Also features Mourning Sickness, John Switzer and PJ Harvey. Book Release Event for author Julie Crysler's All Consuming, a collection of 15 provocative poems and stories. 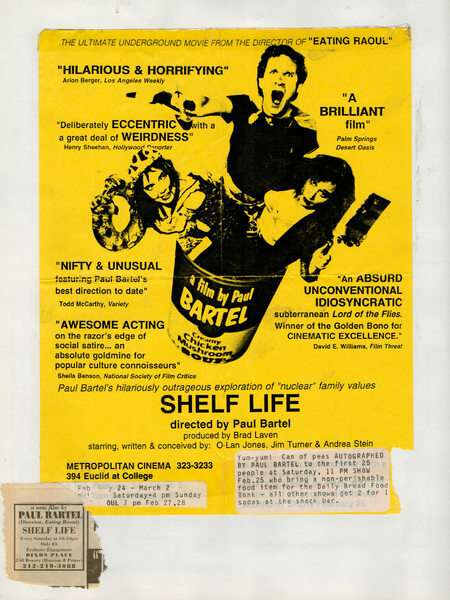 Paul Bartel's rarely screened final film gets a limited run at the bygone Metropolitan Cinema, formerly the Euclid Theatre. 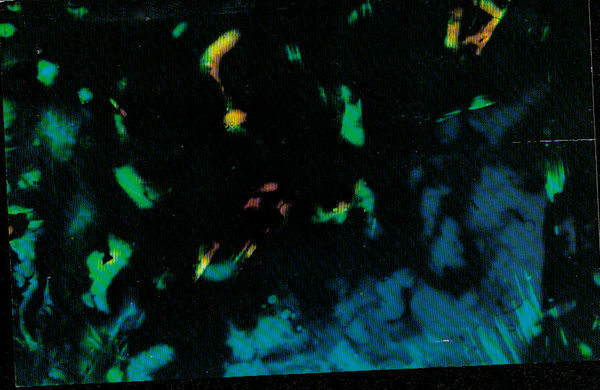 Postcard advertising 2 nights of contemporary 16mm films by American experimental filmmaker Stan Brakhage at Innis College and The AGO's Jackman Hall. The Nancy Sinatras are joined by Canadian indie movie Queen Valerie Buhagiar (Highway 61!) for Movin' With Nancy...These Boots Are Still Walking', preformed at Buddies in Bad Times. 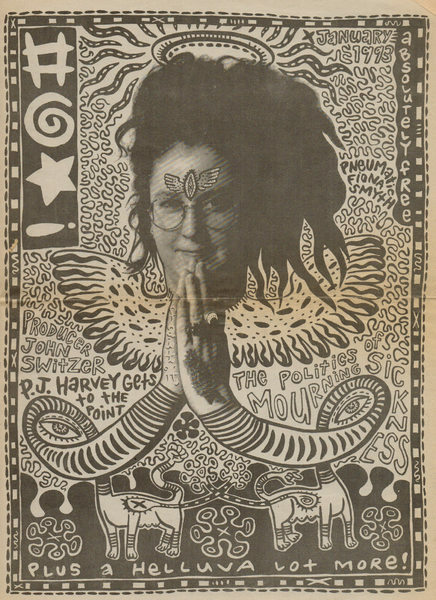 Flyer advertising a benefit concert for the monthly music magazine ! *@# (aka Exclaim!) held at The Opera House. 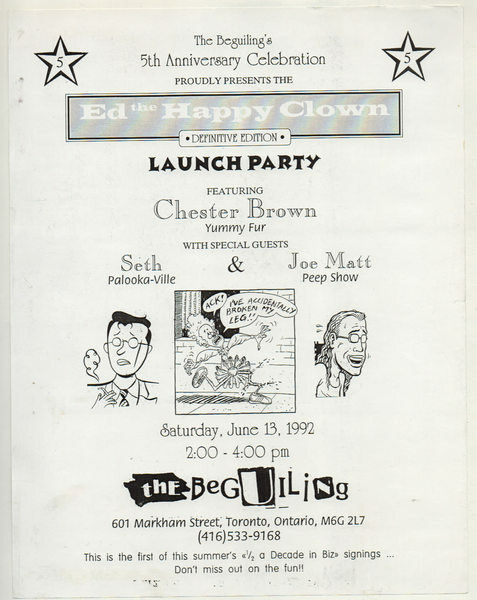 Flyer advertising the launch party of the Definitive Edition of Chester Brown's "Ed the Happy Clown" featuring special guests Seth & Joe Matt as part of the 5th Anniversary Celebration at The Beguiling. 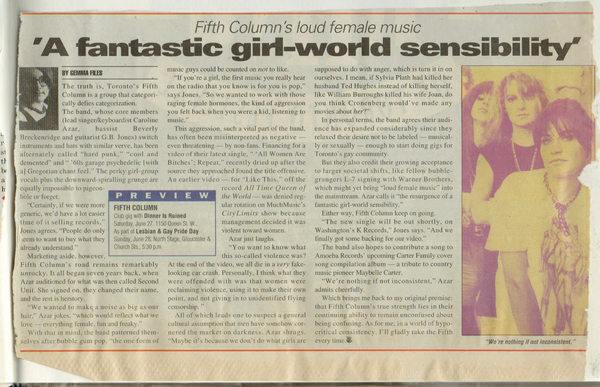 Article on Fifth Column from Eye Magazine written by Gemma Files. 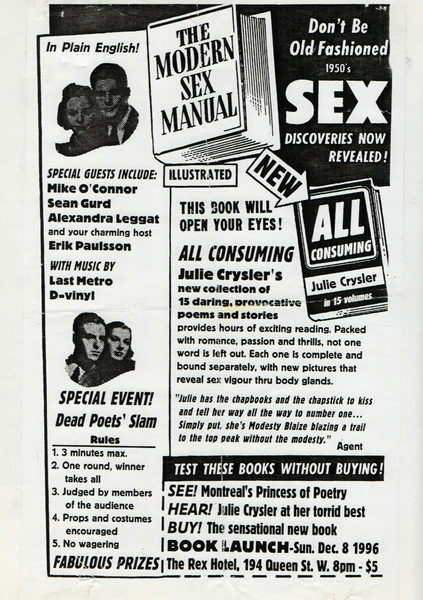 Flyer Advertising Exclaim! 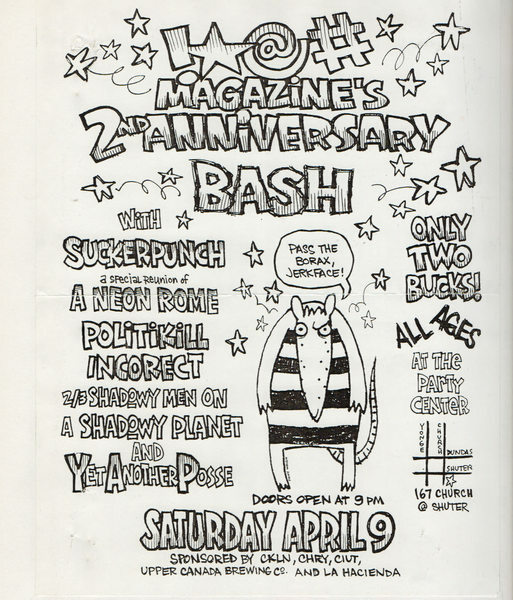 Magazine's 2nd Anniversary Bash drawn by Tony Walsh.